Don’t ignore your sweet cravings! We all need little pleasures to make life more enjoyable, but completely avoiding treats can sabotage your good intentions and make you feel miserable. So you simply need a less-guilty way to indulge. You can easily rustle up these sweet, but healthy, cookies from a few storecupboard ingredients. They will be ready in about 30 minutes so you won’t have to wait long to satisfy those cravings either! 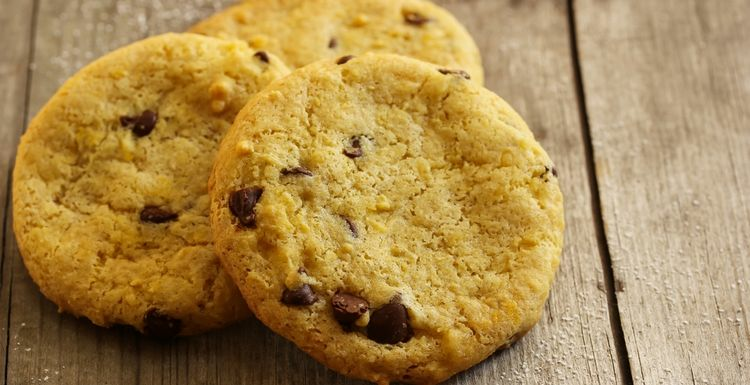 Using wholemeal flour, roasted chickpeas, salt, cinnamon and cayenne pepper gives these cookies great texture, crunch and a flavour to remember. The flour and chickpeas provide extra protein and fibre, while the cinnamon helps maintain blood sugar levels. Preheat oven to 180 degrees C (375F). In a medium bowl, mix together the flour, bicarbonate of soda, cinnamon, cayenne and salt. In a large bowl, whisk the sugar and oil together until well-combined. Add the fruit spread, eggs and vanilla essence and mix well. Tip in the flour mixture and mix until thoroughly combined. Add the oats, chickpeas and chocolate chips and mix again. Line 3 baking sheets with greaseproof paper. Drop 8 rounded tablespoons onto each sheet, lightly pressing each cookie with the back of a fork before baking. Cook until lightly browned, between 13 to 15 minutes. Remove from oven, transfer to wire racks to cool, eat and enjoy. Michael - roasting them gives them a drier texture and a lovely nutty flavour. But it would still work if you just opened a tin. I would just put them in the oven when you're using it for something else - no hassle then. one word - yum. Just the title of these has me drooling,. Do the chickpeas have to be roasted? I don't know if I can be bothered with that, would prefer to just open a tin.